The largest public gathering in the world, the Kumbh Mela is expected to draw as many as 70 million people, a crowd greater than New York, London, and Paris combined, for ritual bathing in the rivers. 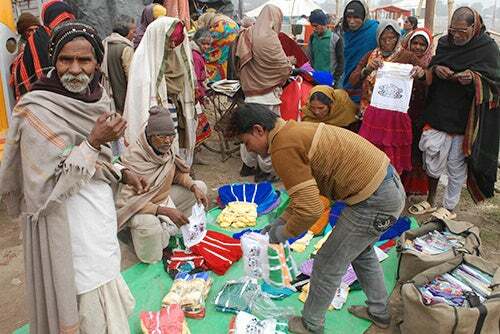 This is the second in a series of articles about Harvard’s interdisciplinary work at the Kumbh Mela, a religious gathering that every 12 years creates the world’s largest pop-up city. ALLAHABAD, India — If you wanted to jury-rig your own local version of Google Maps, you might end up with something like the Harvard Graduate School of Design (GSD) team gathered one January morning, already sweltering under the rising Indian sun. But GSD professor Rahul Mehrotra and his colleagues and students were going where Google hasn’t: into the heart of the Maha Kumbh Mela, India’s “ephemeral city,” an impressive grid of colorful, tent-lined streets that pops up every 12 years to accommodate the world’s largest gathering of Hindu pilgrims. Instead of using a “Street View” van to capture the 360-degree sweep of the city’s streets, the graduate students would be deployed to take panoramic shots on DSLR cameras. And in lieu of high-resolution satellites that capture aerial photographs, the team had a high-powered handheld camera mounted to a kite and flown high in the air. Their equipment may have been modest, but the group’s ambitions were big: to map the mela, or gathering, as comprehensively as possible, from its informal back roads and infrastructure grid to the flow of people and resources in and out of the Kumbh, which accommodates up to 80 million pilgrims on peak days. “We’re trying to map the metabolism of the city,” said Mehrotra, professor and chair of urban design and planning. While the Kumbh is often portrayed by Western media as a mythic spectacle of colorful humanity, Mehrotra and his team were more impressed with the everyday functioning of the mundane. In a country that can barely keep up with its exploding megacities — where electricity, clean water, and safety are rarely assured for hundreds of millions — how does a pop-up tent city manage to run so smoothly? The researchers split into smaller teams, the better to fit into rented Jeeps. Into one went Felipe Vera, a Chilean design student; Christian Blaser, a Swiss architect and colleague of Mehrotra (“I’m here to have a good time and help out,” he said); and renowned Indian photographer Dinesh Mehta and his wife, longtime friends of Mehrotra, who were responsible for the ingenious camera-on-a-kite. They were heading for sector four, one of the more raucous of the 14 zones in the Kumbh, situated alongside the main road leading to the Sangam, the holy confluence of the Ganges and Yamuna rivers. On a narrow bridge leading to the sector, the group’s Western vehicle shared space with India’s ubiquitous green-and-yellow auto-rickshaws; bicycle-drawn carts carrying, food, trash, or firewood; zippy motorbikes carrying whole families; scores of pedestrians; and the occasional traffic-stopping parade of the relatively exotic — child sadhus, elephants, or singing Hare Krishnas (“the Englishmen,” one guru good-naturedly called the America-based religious movement). “It’s much more clean and neat than what you would expect,” Vera said, as the Jeep bumped along. It’s not what the group had expected, he admitted. 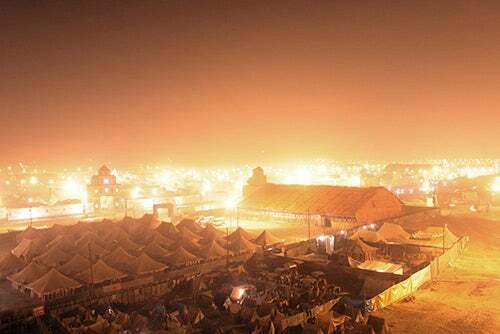 The Kumbh’s surprisingly orderly feel is a result, he believes, not just of the pilgrims’ respect for the sacred space, but also of the city planners’ careful decision-making: wide central roads, well-spaced public toilets, and the casual but pervasive presence of 10,000 police officers. “Cities in India are often not about grand design, they’re about grand adjustment,” Mehrotra said later. “In Indian cities, a lot of the landscape is a kind of temporary landscape,” a phenomenon he calls temporal urbanism. While Indian cities may neglect the slums springing up organically within them, the Kumbh Mela has found a way to make the temporary nature of its housing and infrastructure work. “If we value pluralism and we value coexistence, then these become important lessons,” he said. It’s a common refrain for Mehrotra, whose work as an architect in India, prior to his Harvard appointment, included projects as diverse as the conservation of the Taj Mahal and the design of public toilets. That pluralism was on full display once the sector four team left the main margs, or roads, and entered the city-block space designated to members of the Juna Akhara, one of the largest and most powerful sects at the Kumbh. Each akhara is allotted space by the Kumbh’s administrators before the event begins, and each maintains a high degree of control over how it organizes its “neighborhood.” In the Juna Akhara area, flashing lights, displays of ornamental weapons garlanded with marigolds, and a crowded network of alleys winding among the tents created a vibe that seemed a world apart from the quiet, sparse, and open space of the ashram next door. That diversity can thrive within these enclaves is one of the Kumbh’s lessons for urban planners, especially those who study temporary spaces, such as refugee camps or slums. “Refugee camps, some of them last for 20, 30, 40 years, but they become soulless,” Mehrotra said. Refugees are housed in a repetitive pattern of tents; ethnic groups’ identities are “neutralized” to prevent infighting within the camps. Since joining the GSD faculty in 2010, Mehrotra has been taking groups of students from Harvard’s Schools to sites in Mumbai as part of his studio workshop in “extreme urbanism.” He soon realized that whatever his students’ backgrounds — law, public policy, business, design — they often arrived with preconceptions of how Mumbai functioned and how it should change, baggage that “took a whole semester to unpack,” he says. What the Kumbh Mela offered, in contrast, was a blank slate. Mehrotra took his zeal for the Kumbh Mela’s potential to another Harvard professor who could add gravitas to the project: Diana Eck, a Harvard Divinity School (HDS) expert on Hinduism and pilgrimages in India. The two had first met 26 years earlier when Mehrotra, then a GSD student, did work on sacred towns in India under Eck’s supervision (making their collaboration on the Kumbh Mela project Harvard’s longest-running independent study, he acknowledges with a laugh). Meanwhile, Mehrotra began scouting the site from abroad, having his contacts in India (including Mehta, the photographer; Vera, the GSD student; and Namita Dharia, a Delhi-based Harvard doctoral student in anthropology) visit the area periodically once work began in late October to transform the empty floodplain into a functioning city. With the backing of the South Asia Institute (SAI), where Eck and Mehrotra serve on the steering committee, much of the group was able to travel to Allahabad to pursue the research questions they’d developed in the class. “I think we all recognize that if we have to make the world a better place to live in, we have to put our minds together and not be siloed in our own disciplines,” Mehrotra said. 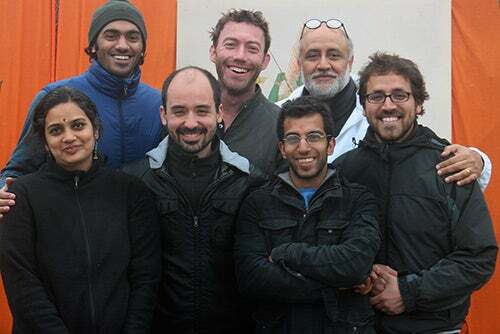 That night, the GSD team regrouped, along with the rest of the Harvard professors, students, and staff who had traveled to the Kumbh, to share the day’s results. There were minor setbacks, such as the failure to obtain a sit-down meeting with a Kumbh official, and successes. Vera, sitting atop a Jeep as it rumbled through the street, was able to get a better vantage for his panoramics. Mehta’s camera had fallen off his kite at 8,000 feet, but after he offered a reward to a group of curious kids lingering nearby, it was returned to him, luckily unharmed. Mehrotra’s team members are pondering what form the final results of all their data-gathering will take. They plan to create both detailed maps and a scaled 3-D model of much of the Kumbh, both of which could be presented in exhibitions or used by other scholars for research. They are also hoping to publish a catalog or book of field notes on the project. Mehrotra is cautiously optimistic that the team’s work might serve as a guide for future researchers who might return to the Kumbh 12 years down the road — perhaps including his own students, like Vera, who is planning to stay in academia after he graduates in May. Learn more about “Mapping the Kumbh Mela,” and follow the South Asia Institute’s blog on the project here. Read previous Gazette coverage here, and watch the Gazette for more stories on the Kumbh Mela in the coming weeks. Harvard Graduate School of Education hosted a panel of leading thinkers who shared their five visions on the future of education. The panel included Robert Schwartz (from left), Jal Mehta, Elizabeth City, Frederick Hess, and Paul Reville.